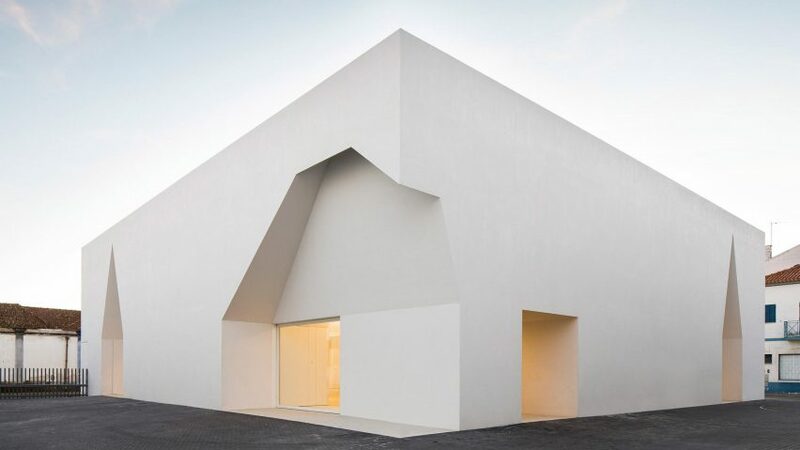 Deep triangular and flat-topped arches are punched through the white walls of this community centre, which architects Manuel and Francisco Aires Mateus designed for the Portuguese town of Grândola. The brothers, who run Lisbon-based studio Aires Mateus, were asked to design the 670-square-metre Meeting Centre building for the community in the Alentejo region, located around an hour's drive from Lisbon. A number of glazed cutouts in the white and unornamented facades of the centre provide entrance points, or windows framing views out to the historic buildings that hem the site. The depth of the recessed openings are defined by a strip of utility and storage units that runs around the periphery of the interior space. Inside, the layout of the building is defined by the complex ceiling, which contrasts the simple exterior form. Angular light wells and planes that hang down from the sloping surfaces loosely carve up the space. White curtains suspended from the bottom of some of these planes can be used to further segment the centre into rooms. "The ceiling, in its variations and geometry answers the programme," said the architects. "A complete horizontal clearness outlines the space as a whole, which as atmosphere opposes to the weight of the vertical voids." "The support functions deepen the external and peripheral wall. The final image is determined by the interaction of internal space and occupied facade," they added. Aires Mateus has now designed a number of houses in Grândola, including a home with a cross-shaped plan and a scooped opening and a pair of rustic holiday cabins. The cabins were designed for two brothers, which Aires Mateus also designed a second holiday retreat for in the region – a former farmhouse featuring a minimal arch as its entrance.